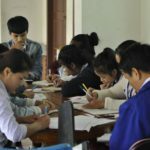 Recognizing Lao’s need for medical education training materials, HLISeattle is creating and providing curricula and medical texts, translated into the Lao language, to all students who complete our trainings. 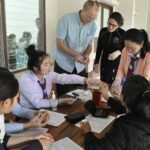 These are valuable resources for Lao health practitioners, especially those serving remote areas, as there are few other health education resources in the Lao language. In addition, all clinical students receive a basic medical kit. 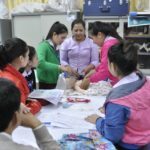 Lao Language Curriculum Materials HLI health educators have designed highly visual, culturally-appropriate curriculum materials for all Clinical, Leadership and Medical English courses. 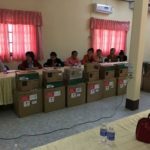 Each year, Health Leadership International raises funds to translate into Lao, publish and print health curricula so that each student who completes the training can receive a set of bi-lingual course materials. This includes two outstanding community health guides, Where There Is No Doctor and Where Women Have No Doctor, both translated into Lao. In addition, Lao students attending Medical English classes receive a copy of Health Leadership’s textbook, English for Health Professionals. Medical Supplies Upon completion of the clinical training, each student is given a basic medical kit that includes a stethoscope and a blood pressure cuff for use at their District clinic. 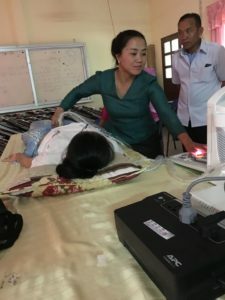 In addition, thanks to generous donations from Sonocite Corporation, Lao radiologists from five provincial hospitals gave been trained and given portable, battery-operated Ultrasound machines for diagnostic use in the field.